Oh wow! This secret garden party is the frigging bomb! big fun, big fun, big fun! 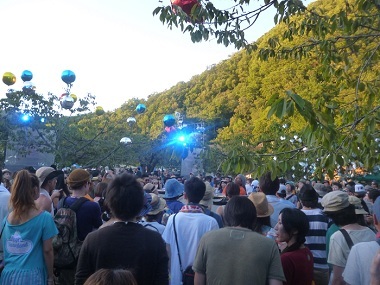 This annual dance music party is aptly called the Summer Stage Sapporo “Big Fun” Garden Party set in the beautiful summer sun in a fruit orchard……near Jozaaaaaankei. This is truly my favourite party of the summer in Sapporo Japan. The music is dancey house with local DJs and there is always a big international DJ that flies in to spin the decks(computer) into the summer night. I like dance music but I don’t really follow it anymore, not like I used to back in my student days, so I didn’t know any of the DJs. Even if you are not into that kind of music it’s still bags of fun. 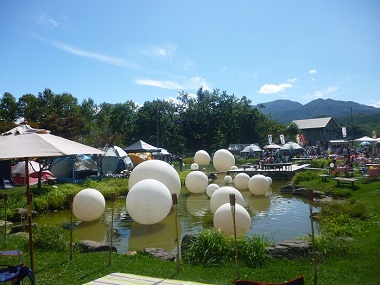 The Big Fun Garden Party has been running annually, at the beautiful grounds of Hakkenzan fruit orchard which is very close by to Jozankei just outside of Sapporo city, since 2008. It’s such a great location with a couple of ponds and fields to lie down and have a picnic. Have you ever wondered where all the cool people in Sapporo go? Well, this is where they go. The party is full of attractive, stylish, “real” people. I met friends who I hadn’t seen for a while and made some new ones too. There were quite a lot of families and kids around which makes the event feel more like a garden picnic as opposed to a phat rave. However, when the sun goes down the tunes take a turn and the beat gets dropped a little more often. Since living in Sapporo Japan I have been to a few house/techno nights at a club called Precious Hall (the organisers of the Big Fun secret garden party) but Japanese house and techno is a bit different from their European counterparts. It’s much more repetitive and the DJs like to build up the crowd, but they never “drop it” when the crowd has reached their peak, instead they slowly build it back down, leaving me disappointed. The international DJ they got in, Joaquin ‘Joe’ Claussell from New York city did not disappoint. He started his set at about 5pm (played till the end of the party) with a very mellow, hypnotic, wind percussion track and I thought “oh no, it’s gonna be one of those monotonous, psychedelic sets”, but the next track had a bit more funk to it mixed in with some female vocals, and then as the night went on he played more and more funky house. I haven’t heard funky house for ages, definitely not in Japan, and I used to love it! At about 7pm there were fireworks and the crowd went nuts. I tell you, Japanese girls really like fireworks. I mean like they are bonkers over them. The girls next to me screamed every time a firework exploded in the sky. I like fireworks, but calm down love. So during the day of the Big Fun secret garden party we just hung out on the grass drinking beer, which we snuck in. You are not allowed to bring in your own food and drink as the party is sponsored by Suntory so you have to be drinking their beer. You do get searched at the entrance but they are not very strict. You could hide a few beers in a back pack. Just don’t try to sneak in a huge cooler of beers. My friend got past the security at the entrance but then got busted by a patrol worker inside. You can easily just leave your beers in your car and come and go as you please. There are lots of food and drink stalls selling your regular festival Japan food such as yakitori (meat on a stick), yakisoba (fried noodles) etc. You can also have a barbecue at the venue. Everything is provided so you don’t have to bring anything and the food is really good. We had Jingisukan, a range of meats and seafood and vegetables and it cost us 1,000yen each. Great value for money. Due to the awesomeness of this event, I think Big Fun will not remain a secret garden party for much longer. Ave it! 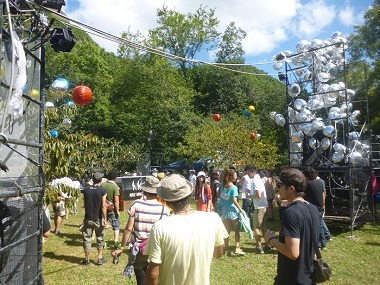 There are regular buses from Makomani subway station (end of the Namboku Line) to the secret garden party which takes about 30 minutes. Adults are 470 yen and children are 240 yen one way. 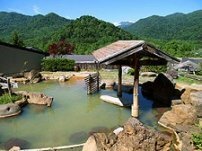 Address: Hakkenzan Fruit Orchard, South district, Jozankei, Sapporo. Start time 12pm, Close 9pm. 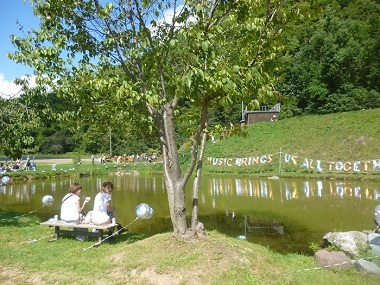 The secrent garden party is about a 30 minute drive outside of Sapporo. Parking at the venue is 800 yen.